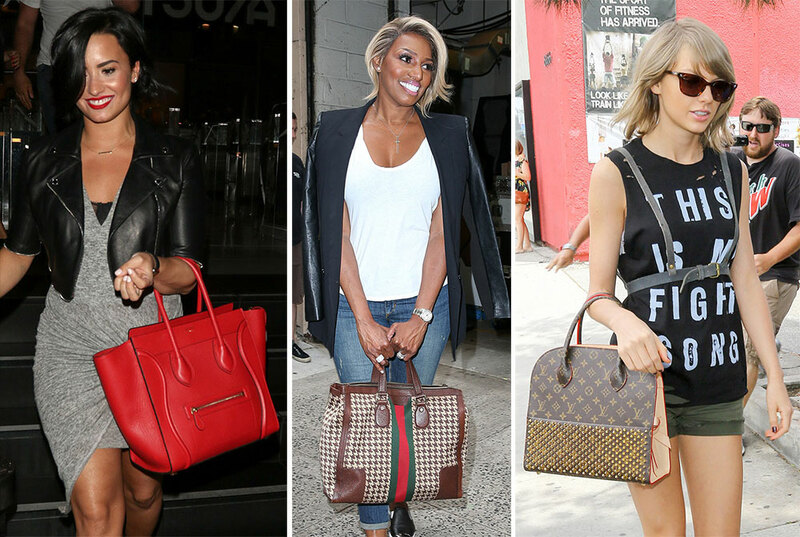 Céline still holds a firm grip on the hearts of celebrities, and they have the bags to prove it. Céline is still much beloved by hordes of less famous bag lovers, of course, but we can't all bankroll the Luggage Tote collection of our dreams. Thus, we must live vicariously through Demi Lovato and Kylie Jenner. There are worse ways to get your kicks, I suppose. Demi Lovato was recently snapped leaving the LA sushi restaurant Katsuya with a bright red Phantom Luggage Tote that matches her lipstick. Here's Hilary Duff leaving an appearance on The View in a super low-key jeans-and-tee ensemble that includes a basic black Céline Trio. Yes, this is JANET JACKSON, cruising through LAX with an excessively elegant black croc Birkin. Janet, we love you, please come back to us. The celebuverse needs you. Here's a gorgeous green and white carnival-striped Phantom Luggage Tote that renews my interest in Phantom Luggage Totes, dangling from the arm of Kylie Jenner as she leaves Fred Siegel in West Hollywood. Nene Leakes recently filled in for Kelly Ripa on Live! With Kelly and Michael, and I feel that the powers that be should know that PB is strongly in favor of a Nene Leakes daytime talk show. Here's Nene leaving the studio with a retro Gucci tote. Here's Rosie Huntington, leaving a friend's house in LA with an attractive calf hair-paneled Chloé Faye. Chloé's stock just went up slightly. Taylor Swift was recently spotted hanging out in Hollywood with gal pal Selena Gomez. Her Louis Vuitton x Christian Louboutin Monogram Tote is popular with celebs, but a surprising choice for T-Swift, who has never seemed particularly fond of either brand individually. And finally we have Tia Mowry, shopping in Beverly Hills with her Givenchy Lucrezia, hopefully for a new pair of overalls. This pair looks a little drafty.